As an accountant working in an organisation you know that presenting financial information is a core part of your role. Some do this in a way that almost seems effortless. Others struggle. Over the years, I’ve noticed there are several challenges that accountants seem to face. So what are the challenges of presenting financial information and how can you overcome them? No I haven’t lost the plot. We all talk to ourselves or think things. One of the common things that might come up is that people are not interested in the financial report. Another thing is that people don’t really understand the numbers. Stop trying to be a mind reader. Some will be interested. Some won’t be interested. Don’t buy into the myth that people don’t understand the numbers. They might not know the technicalities but they can understand that you need to set prices at a higher level than what it costs to make money. Different audiences have different requirements. The marketing team you support needs more detail than the Board who want the big picture. Map out the different audiences who you present to and consider what they need. In Finance Excel is widely used. Excel is great for manipulating data, doing scenarios, forecasts, looking at trends. It’s not a presentation tool. 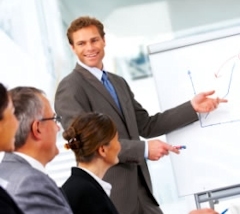 PowerPoint is a presentation tool. There’s a risk that you end up loading up slides with too much content. Don’t start with the assumption that you need a presentation. Start by thinking about the best way of getting your message across in a way that will have the greatest impact. Good delivery doesn’t happen by chance. It’s a performance. Like all performances you are not likely to get it right first time. Poor delivery is a consequence of what you do before you deliver your presentation. Prepare rigorously before you deliver a presentation. Use audio recording, video and even mock presentations to practice so that you deliver with confidence and clarity. The reality is that this is a key skill for any accountant. So what action are you taking to improve your presentation skills?